DO YOU KNOW A RAILFAN? This term includes every little boy, child, adult and grown man who is still infatuated with trains, train tracks, vintage trains, and the history and innovations of the first American Railroads. 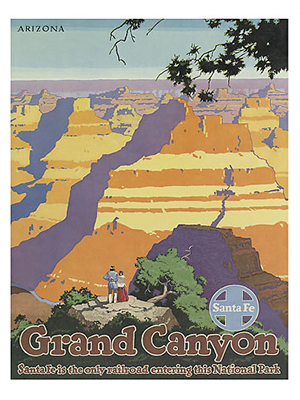 If so, or if you just love collecting vintage art prints, check out our selection of vintage Santa Fe Railroad art prints and posters between the era of the 1940’s and the 1950’s. 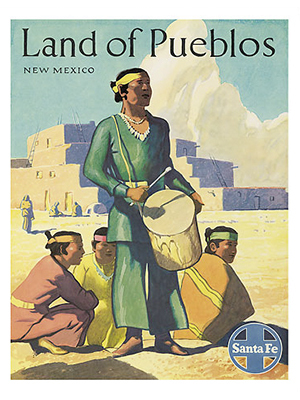 These images are rarely seen, and are a unique gift for those who favor Americana, Vintage, Southwestern and Native American influenced Art. 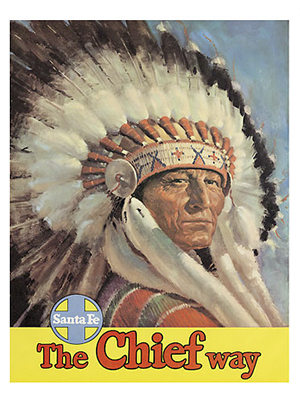 The ATSF, (Atchison, Topeka and the Santa Fe Railway), was often regarded as just the “Santa Fe,” due to its logo driven promotions and colorful print advertisement images seen during the 1940’s and 1950’s. 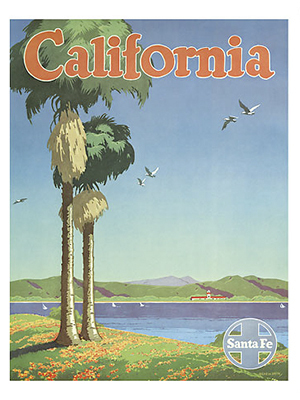 The Santa Fe Railroad was one of the first innovators for inter-modal freight and travel services in the Unites States; tugboat fleets, domestic airlines, and bus lines that would help passengers reach destinations such as San Francisco which before then could not be reached just by rail. By the end of the 1970’s, ATSF operated over 12,800 miles of road and approximately 21, 472 miles of train tracks. For almost 140 years, Santa Fe Railroad played a key role as a leader in American transportation, and new developments in U.S ground travel. 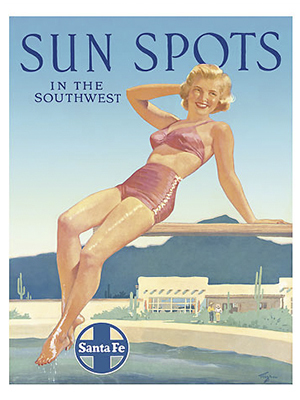 In 1996, Santa Fe merged with the Burlington Northern Railroad, and is now a part of BNSF Railways. This entry was posted on Wednesday, February 27th, 2013 at 12:10 pm. 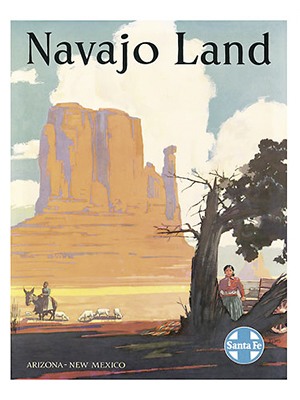 It is filed under New Images and tagged with American art, americana, art prints, Giclée Print, historical prints, native american, New, rare travel art, Retro Realism, santa fe railroad, southwestern art, travel art, Vintage poster, vintage railroad art, world travel posters. You can follow any responses to this entry through the RSS 2.0 feed. Love the Santa Fe collection. Is there a widget you can add to share on fb or t?